With a design that is sure to make a statement, the Langley Dining Table will definitely turn some heads. 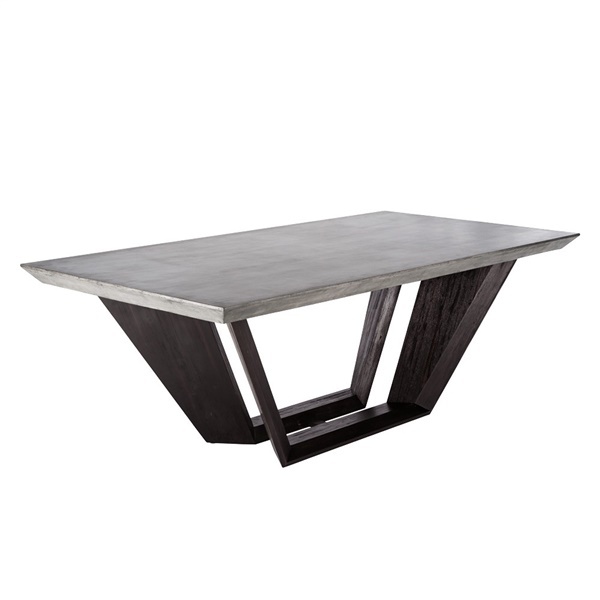 Constructed with a substantial concrete top and an acacia wood base, this table utilizes aspects of both modern and rustic architecture. The beautiful materials are tapered to create a visually stimulating piece of furniture that will be in style for years to come. You can put the Langley Dining Table in just about any room and it is sure to become the focal point of the space. How many people can be seated at this table? This table can seat 8-10 people depending on the width of your chairs. Do you have a specific chair you are looking to pair this with? The table top is made of solid concrete, which will have variations in color between gray and taupe. The base is made of solid acacia wood finished in a dark coffee bean color.